When comparing prices on tow dolly rentals in Hollister, San Jose and Santa Cruz, ask about sales tax and environmental fees. Towing small to medium sized vehicles. 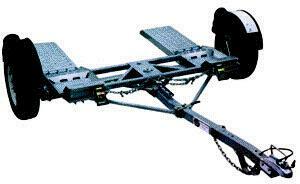 Maximum Outer Wheel Base Width 74"
Minimum Outer Wheel Base Width 42"
The Manufacturer requires the towing vehicle to weigh at least 1,670 lbs more than the vehicle being towed. * Please call us for any questions on our tow dolly rentals in San Jose, Campbell, Salinas, Santa Cruz, Watsonville, Morgan Hill, Hollister, Santa Clara, Gilroy, Milpitas Sunnyvale, Fremont, Salinas, the Greater Bay Area and the Monterey Peninsula.